The moment you notice a risk of fire in your restaurant business, you want to be able to act quickly and without hesitation. That is why you should always have Ansul fire suppression systems at the ready. The moment acrid smoke and dangerous fire become present, Ansul fire suppression systems will allow you to take control of the situation and mitigate any fire damage, protecting your investment and keeping staff and customers safe. If you are in the Denver, Colorado or Los Angeles, California areas, call Nationwide Fire Protection for the best Ansul fire suppression installation services. Our Ansul fire suppression systems are thoroughly inspected and guaranteed to keep property and individuals safe during the outbreak of fire. When a devastating blaze does erupt, either in your commercial kitchen, dining room, or another area of your restaurant, you can’t just throw salt on the fire and call it a day. Many restaurant fires are the result of high-temperature oils and gases, which means that the flames need to be extinguished with powerful fire extinguishers. This quality and heavy-duty fire extinguishing power are what the Ansul brand is known for. The restaurant and hospitality industry continues to grow and along with all those eateries have come ever-stricter industry standards. This means that your restaurant needs to be code-compliant with all local and Federal government agencies. Nationwide Fire Protection is a recognized, nationwide Ansul fire suppression systems provider. We offer the services of professionally-trained and certified staff who can stock your restaurant with the latest Ansul fire suppression equipment and systems to keep your building, occupants, and business investment safe at all times. Whether you’re in the Denver or Los Angeles areas, we offer fire-suppression by the best in the business, Ansul fire protection systems. Our fire suppression system by Ansul comes complete with an Underwriters Laboratories 300 compliant fire suppression system. Each system comes with a chemical bottle, control head, pull station, and CO2 regulator. We are a one-stop-shop for all Ansul and other fire suppression systems. That means that we can ensure that your Ansul system is effectively connected to your ventilation hood and make-up air systems, as well as any micro-switch assemblies and safety interlocks. All electrical work and connectivity repairs will be conducted according to National Fire Protection Association and Underwriters Lab sequence requirements. We Take Care of All Red Tape: Our goal is to provide you with complete peace of mind while giving you the latest Ansul fire protection equipment for the protection of your business investment. We can take care of any plans and engineering drawings and handle permits so you don’t have to. We can manage all aspects of your Ansul fire protection system installation services, allowing you to remain confident that the safety of your restaurant is always in excellent hands. You always want to know that your Ansul fire suppression systems will react quickly whenever there is a high risk of fire. At National Fire Protection, we can provide you with systematic Ansul inspections that allow us to analyze and make recommendations regarding your kitchen exhaust systems. During our inspections, we can also provide you with a thorough cleaning of all Ansul fire suppression systems and their applicable components. If there are problems with your fire protection systems, we can perform all addiction repairs, even going so far as to replace necessary equipment to keep your business operating safely and compliantly. 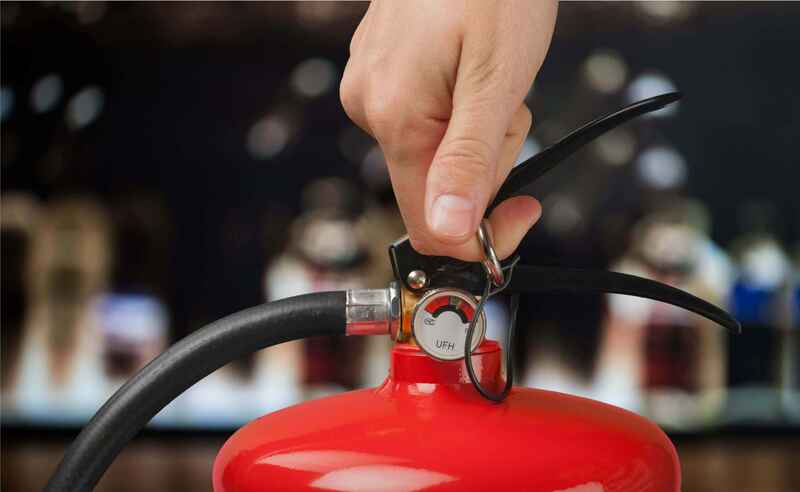 With full testing and maintenance of your Ansul fire suppression systems, fire alarms, and fire extinguishers, you’ll keep the risk of fire at bay and maintain code compliance long into the future. Call National Fire Protection in Denver and Los Angeles for a free estimate for a fire protection maintenance plan that works with your schedule and budget. You always want to know that your portable fire extinguishers are going to be available whenever you need them. From your dining areas, your kitchen spaces, and every inch of your restaurant in between, fire could break out in these areas at any moment. Is your staff prepared to act quickly? In addition to providing our Denver and Los Angeles clients with the latest Ansul fire suppression and protection systems, we also offer portable and other top brand fire extinguishers that are ready to be used at a moment’s notice. We offer a variety of extinguishing agents, repellant gas fire suppression systems, and proper identification of use class to keep your business fire code compliant. Get the fire protection you need with cutting-edge fire extinguishers by Nationwide Fire Protection. If you don’t have the right fire suppression and protection, you could be putting your restaurant business at risk. Get top quality Ansul fire suppression installation and fire extinguishers, as well as all other types of fire suppression, so that you can protect your investment from the risk of dangerous and deadly fire. The right suppression systems are only a phone call away. We can come to your location with professional and experienced personnel to provide you with a free quote. Your estimate will include all relevant fees without any added or hidden fees. You can expect meticulous attention-to-detail as we help you maintain fire code compliance and keep your business constantly alerted to the risk of fire with fire alarm systems, fire suppression systems for the ventilation hood, make-up air systems, and ductwork, and much more. For Ansul and other fire protection systems installation, maintenance, and repair in Denver and Los Angeles, call today for a free quote.